Salts shaping ice crystals ? Well, it looks like it, indeed. Today, we report in PLoS One some very intriguing results, which kept us busy for the last 3 years. I never worked so long on a topic before publishing a paper, by the way. Okay, some feedback first. My main occupation is this ice-templating thing, using ice the growth of ice crystals to template the porosity in various materials (ceramics, mostly). One of the issue bugging us is that the growth of the ice crystals depends on (too) many parameters. Depending on what you put in your suspension and how you freeze it, you ends up with a variety of unpredictable morphologies. In an ideal world, you want to control the morphology of the ice crystals (and hence of the pores) independently of the other processing parameters, to make your work more predictable and reproducible. So you need to control ice crystals. Easier said than done, though. You need, for instance, a compound that will interact directly with the growing crystals, in order to precisely control the growth of the crystals at the atomic level. And your problems start here. Finding such compound is no easy task. Many people are interested in controlling ice crystals growth, from engineers to biologists and the food processing industry (ice cream, yummy), to name a few. A number of living organisms and creatures are also very interested in controlling the growth of ice crystals, such as fishes or insects. Such control is exerted through the so-called antifreeze proteins. A whole family of proteins which can prevent, slow down or retard the growth of ice crystals and thus avoid and/or limit the freezing induced damages. How these proteins interact with the ice crystals is still under debate, and is arguably one of the toughest recognition problem in biology, though it looks like an important part of the puzzle has been solved recently. Antifreeze proteins are nice, but awfully expensive and difficult to extract. Cheap and easily available synthetic compounds are therefore highly desirable. Synthetic compounds have been developed largely based on what we understand about antifreeze proteins. All substances known to date to interact with growing ice crystals have all been macromolecules – proteins, glycoproteins or polysaccharides. 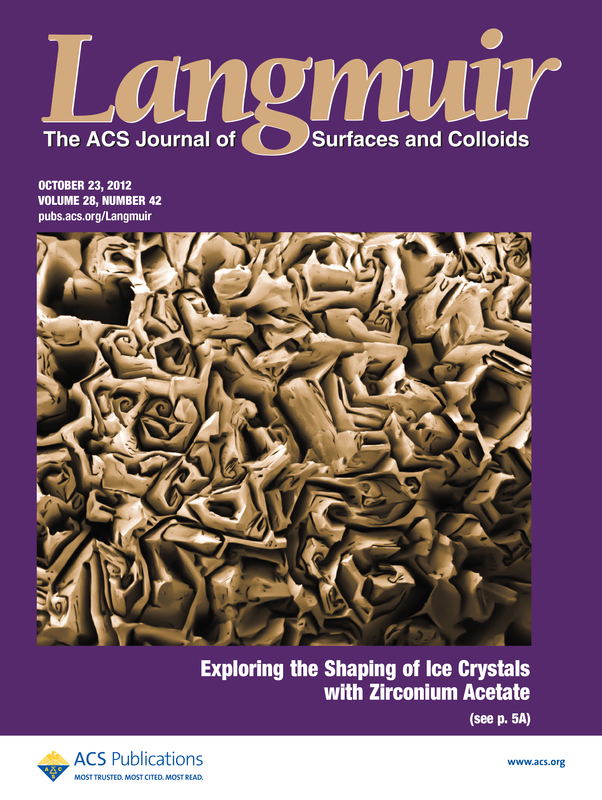 What we’ve found, by complete accident of course, is that a simple salt (zirconium acetate) can exhibit such ice shaping properties. The ice crystals in presence of this salt adopt their equilibrium hexagonal structure. 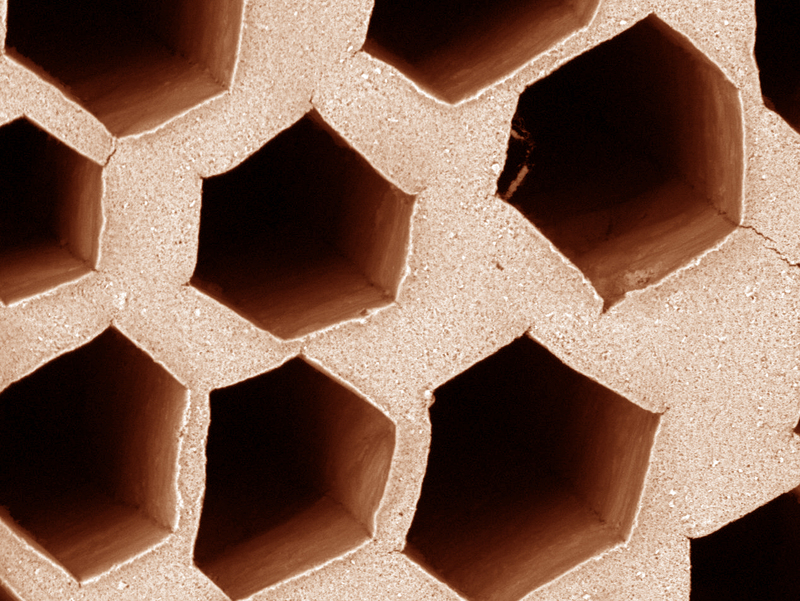 In ice-templated materials, this results in the formation of faceted, hexagonal pores, like the ones below, in comparison to the usual dendritic morphologies. This is both remarkable and intriguing. Salts have never been shown to have an ice-shaping activity on their own. The ice shaping activity seems very similar to that of antifreeze proteins. We first discovered this three years ago, by accident. And as of today, we still have no explanations of the mechanism by which this salt is controlling the growth of the ice crystals. The safest bet would be the formation of an ice-interacting network, based on the association of the ionic complex formed in suspension by the salt. And yet, we have no clues of this happening so far. We hope that these results will prompt further work from other group to investigate this more thoroughly. If you are interested or have suggestions about what’s going on, keep in touch ! We’d love to hear about it! You can find the original paper here. PLoS One is open access, so go ahead ad download it for free. It appears that this is the first materials science paper in PLoS One ? Filed in chemistry, though. UPDATE 10/25/11 The CNRS issued a nice press release about our work. Check it out here. I just stumbled upon this post from Daniel Lemire. Research papers need versioning: the authors should revise their most important work, to fix bugs and improve the presentation. Important research papers should be perfected as much as possible. This would be oh so nice ! I love that idea, although the implementation sounds totally unrealistic. Like everybody else, I guess, my research have been and is very incremental. We come up with new ideas and hypotheses, and a couple of months (years) later we improve it. Thus there are two ways you can work: publish a new paper every time you’ve made substantial progress, or wait until the paper is,indeed, as perfect as possible. In which case, eventually, you never publish, and you might be in trouble if you don’t have a tenure position, since the publish or perish mantra is pretty much the major constraint today. Combine this with the idea I found the other day (I can’t find the reference anymore, though) that you are only allowed to publish 5 or 10 papers in your entire career, so that you have to focus on the most important ideas and most innovative work you can come up with. That would cut the background noise considerably.